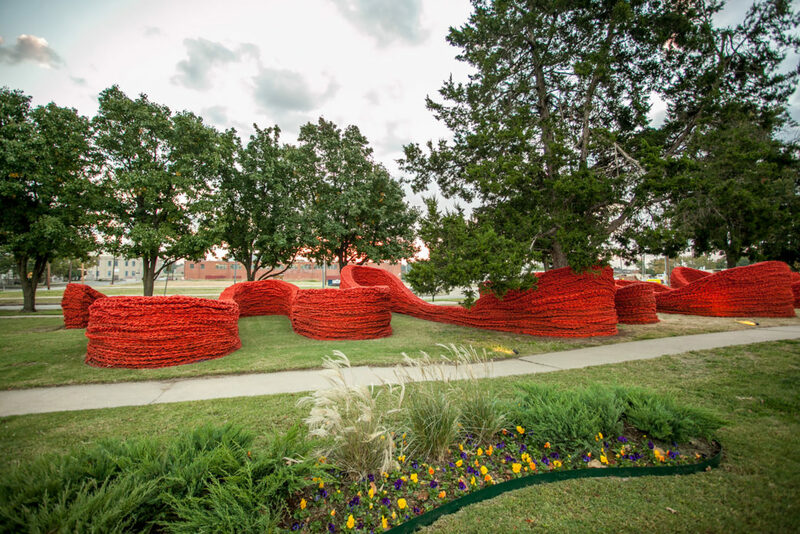 At Oklahoma City's NW 11th and Broadway, Campbell Art Park is a destination for community interaction, art education and exhibitions. Terra, pictured above, was on site October 2014 through April 2016. Tomas Saraceno's Cloud City graced the park in the fall of 2016, and Erwin Redl's Whiteout opened there in October 2018. In addition to a variety of educational programs and events, members of the public can schedule community events consistent with its character and urban location. Please follow the links below to download the Park Rules, Use Agreement, Application and Site Plan. Email all completed forms to showroom@okcontemp.org or deliver to the Showroom, 1146 N. Broadway, during regular business hours (11 a.m.-6 p.m. Wednesday-Saturday, 11 a.m.-8 p.m. Thursday). Applications must be received and approved at least 30 days before the event.